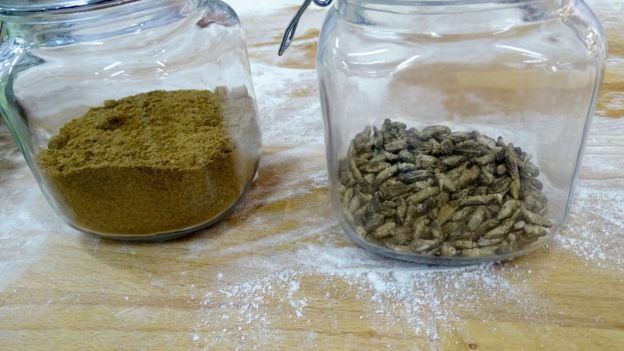 A Finnish bakery is to offer bread made from crushed crickets in a move that is hoped will help tackle world hunger. Fazer Bakery in Finland said the product, available in its stores from Friday, was the first of its kind. Each loaf produced will contain about 70 crickets that have been dried and ground, and then mixed with flour, wheat and other seeds. In 2013, the United Nations estimated that at least 2 billion people eat insects worldwide. According to the UN, more than 1,900 species of insect are used for food. The UN’s Food and Agriculture Organisation (FAO) began a programme in 2013 to encourage the breeding and consumption of insects. Juhani Sibakov, head of innovation at Fazer, said the concept had been in development since last summer, but it could not be launched until approved by Finnish authorities. Earlier this month Finland lifted a ban on the sale of insects raised and marketed for food use. Five other European countries – the United Kingdom, the Netherlands, Belgium, Austria and Denmark – already allow this. Mr Sibakov said the bread contains more protein than normal wheat bread. “It offers consumers a good protein source and also gives them an easy way to familiarise themselves with insect-based food,” he said. Fazer, which imports the cricket ingredients from the Netherlands, only has a limited supply. However it said it was working to find a local supplier. In many parts of the world, insect-eating is common. In the West, edible bugs are becoming more popular with those who want a gluten-free diet or to protect the environment. Farming insects may use less resources than faming animals.